What kind of negotiator are you? What does your post-Brexit Supply Chain look like? With Wimbledon now in full swing, have you ever thought about what goes on behind the scenes in order to put this huge event together? It is a very interesting example to look at in regards to both logistics and supply chain due to the sheer amount of goods & services required and the unique specification of the products utilised. How do they get what they need where it needs to be? With a 130-year history, Wimbledon has had the chance to ensure that its supply chain runs perfectly, and it has to – according to the official Wimbledon Website, the event is the largest single annual sporting catering operation carried out in Europe, serving a huge quantity and array of food and drink. Strawberries are probably the food that is synonymous with Wimbledon, and arguably the most popular item on the list; around 28,000kg are consumed within the fortnight. This equates to 8,615 punnets, each containing a minimum of 10 strawberries, that are eaten daily. The lifecycle of the strawberries for Wimbledon starts in Kent in a LEAF marque certified farm. LEAF stands for Linking Environment & Farming, and it is an environmental assurance system which recognises sustainably farmed products. Chosen sites used for Wimbledon crops use a LEAF integrated farm management system which combines traditional farming methods with modern technology to ensure high standards of production, with minimal impact on the environment. The growth of strawberries this year looked to be behind schedule due to a wetter than average April and May. Volumes have since picked up and visitors will be pleased to know there will be plenty in supply for the tournament! To ensure the strawberries are as fresh as possible they are picked the day before they are due to be served and arrive at Wimbledon at around 5:30am, after travelling some 50 miles from Kent, where they are inspected for quality before being prepared for sale. 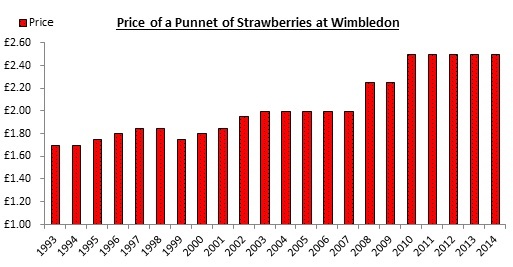 The price of a punnet of strawberries has fluctuated very little over the last 10 years, with the largest rise being in 2008 where the price increased for the first time in 5 years as a direct impact of the credit crunch. However, in 2012 researchers at the University of Reading calculated that if bees were to disappear altogether, the price of strawberries would rise by 84% – the knock on effect would be that a punnet of strawberries at Wimbledon would rise from the current price of from £2.50 to about £4.14. Every product and aspect of Wimbledon is meticulously prepared for months in advance of the big event. Take for instance, the tennis balls – 54,250 will be used during the Championship period. Slazenger has been the official providers of the tennis ball at Wimbledon since 1902, with yellow balls being introduced in 1986. The act of getting the official ball to Wimbledon actually involves a surprisingly complex supply chain. According to analysis undertaken at Warwick Business School, materials for the ball are flown into the Philippines from the USA, New Zealand, the UK, China, South Korea, Japan, Greece, Thailand and Malaysia where they are then produced. It does not end here – they are then sent to Indonesia for packaging, before being sent on to their final destination – that is 11 countries, 4 continents and 50,570 miles before it gets to Wimbledon! On the face of it, it sounds like a very inefficient supply chain – and would certainly raise eyebrows if we were presented with this by a client – however Slazenger have done their homework and this is the most cost-effective way of making tennis balls! there are also 39,000 spectators in the grounds at any one time to consider, which to put into perspective is 464 double-decker buses full! Staying with the transport theme, there is obviously going to be increased traffic into the area. Wimbledon can be reached by tube, train, car, bus, tram, motorcycle & coach. A park and ride service is also offered, so Wimbledon are managing their modes of transport quite successfully, in fact, it seems the largest queues are people waiting to get tickets for Centre Court! When you are tuning into Wimbledon this year take a moment to think about what a giant feat it is and how so many varying elements have been pulled together to make it happen. Your supply chain may not be as complex as Wimbledon, but it still needs to be efficient! To find out how SpringTide can help you, get in touch with us today. We hope you found this blog post useful. We look forward to hearing your thoughts (you can post comments below). If you'd like to hear more about what we do, you can sign up for our newsletter or you can contact us.